I always find it funny when seeing something that reminds me of the "good old days". To be honest I don't think of myself as getting close to 50, is that considered middle aged? If you asked me when I was twenty if I would ever have these "good old day" memories I would have laughed, I mean my whole life was ahead of me, I lived for the moment, I was young with no life experiences. And if you said to me today I could go back in time I frankly would say no thank you, I like where I am in my life today. Stampin Up! is certainly bring back those memories these days. 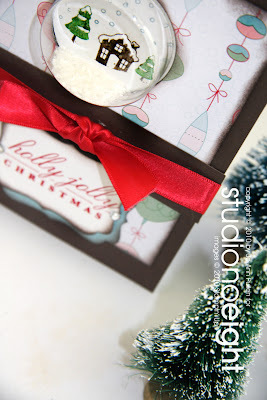 Starting with the DS paper Candy Cane Christmas. I remember when I was a little girl I would go bowling with my dad on Friday nights (he is still doing this today in fact he was bowling tonight, a long way from last April and his brain tumor). I would pack my little play case, all my dolls and enjoy an evening with him watching him bowl and me playing with dolls. Such a wonderful memory. At the bowling alley there was an ice cream machine decorated with a very similar design as our DS paper including the colours. I remember how it worked and it even lite up and the fact that it looked like a snow globe showing the items inside, it was from 70's and I thought it was so cool, not like today's machines but cool and retro. Isn't it odd how even the simple things remind you of other times. So in memory of my youth, I celebrate this memory of my childhood in a simple card.